Plastic food packaging is preventing many of them from recycling more, composting more, and moving toward zero waste. One of the recommendations we discussed to increase your businesses waste diversion was to eliminate or dramatically reduce the size of your trash can. Today, I’d like to go into more depth here on this issue and why I think this is one of the most powerful and under utilized tactics to increasing your waste diversion rate as a business. Eliminating your trash will dramatically increase your recycling & composting rates. Why is this true? Well, changing a person’s behavior is not an easy thing to do. If unmotivated, people tend to do what they’re used to, what’s easy, and what’s comfortable. Most people are used to putting all of their waste in 1 trash can. So long as a trash can is available, that will continue to happen. That’s why you need to do something that will force behavior change. If you’re used to putting all your trash in a trash can and all the sudden there is no trash can… well, now you have to figure out what to do with that waste. *ENTER OPPORTUNITY TO CHANGE BEHAVIOR*. Now you’re confused. You have a bunch of waste, but no trash can, and you’re looking for someone to tell you what to do with your waste. This is where amazing recycling and composting signage + trained employees are key. These signs & people educate you and tell you to put your recyclables in the recycling bin and your compostables in the composting bin. 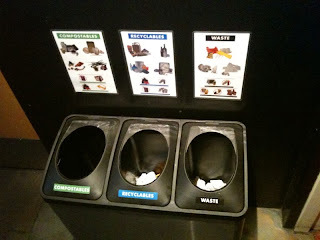 And as a result, you change your behavior and divert more of your waste to recycling and composting bins. Cut down on your waste hauling costs. Many municipalities and waste haulers charge money to take away your trash. If you have less trash, then that’s less money spent having it hauled away. Further, some cities (e.g., San Francisco) offer businesses rebates if they shift their waste from trash to recycling & composting. Save space in your store or office. Many of the small businesses we’ve worked with have told us that they have trouble finding space for 3 bins: trash, composting, and recycling in the front of their house. The simple solution – eliminate your trash can and move to a 2 bin system for recycling & composting only. 3-compartment waste containers can be hard to find. We’ve also heard this from multiple business owners. One of the businesses we’ve worked with, Rigolo, in Laurel Heights in San Francisco, CA had such a difficult time finding a classy 3 bin system that he eventually had to go forward with a DIY approach (shown at top of page), where he sawed holes into the lids of these bins. 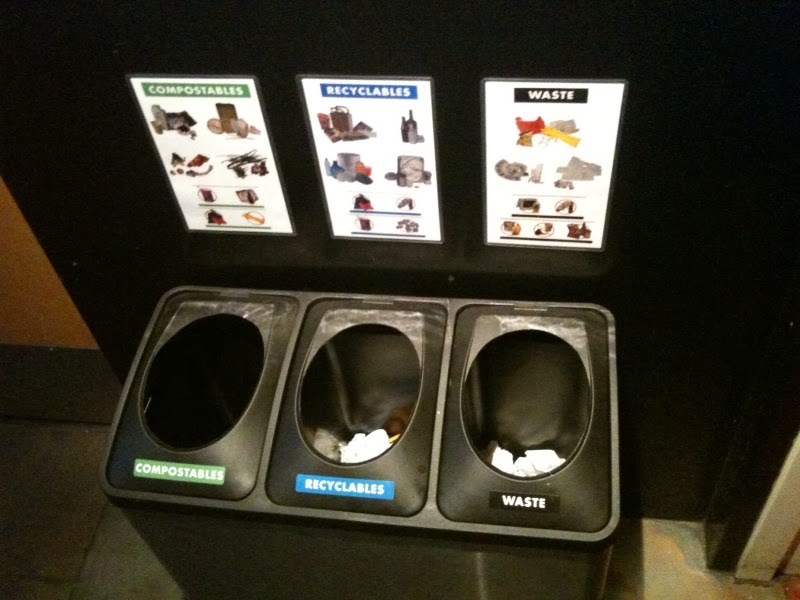 If you only need 2 bins, there are more options available and you don’t encounter these problems. 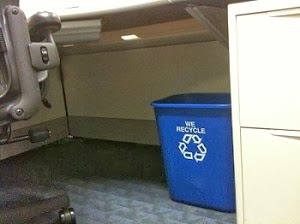 To throw something in the trash now, employees must get up from their desk and walk to the kitchen on the floor. Once at the kitchen there are then also composting and recycling cans available with signage encouraging employees to put items into the correct bins.My girlfriend is interning at Clorox in Oakland, CA this summer. She told me earlier this week that the Clorox green team has removed all the trash cans in every cubicle within the building. 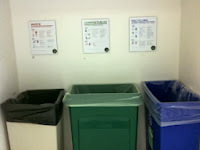 Cubicles now only have recycling bins. This is a huge step in the right direction and a big kudos to Clorox. If you think about the type of waste you have at an office, almost all of it can be recycled: copy paper, mail / envelopes, plastic bottles, staples / paperclips, packaging, etc. The fact of the matter is though, most of us are quite lazy. If you have a trash can in your cubicle, you’re very likely to take the easy route and just put all your waste into that one trash bin. Clorox however has now forced employees to get up and take their waste to an area where they’re encouraged to compost & recycle most of their waste. Great work. But what do I do with items that can’t be composted or recycled? First, eliminate as many of these items as you can. Most should not have to be used daily. Restaurants and food service businesses can move to re-usables & compostables. Offices, as I’ve said, should be able to recycle the vast majority of their waste. For the few businesses though that still have to use items that are not recyclable or compostable, I recommend having a very small trash can that is not easily accessed by customers or employees. For instance, Loving Cup, a rice pudding shop in San Francisco, keeps a very small trash bin behind their counter. This way customers must ask an employee to use the trash if they really have something that shouldn’t go in a recycling or composting bin. But, aren’t our recycling and composting bins going to be contaminated? Preventing contamination is the key, and as we’ve said before, good signage will go a long way toward preventing contamination. It’s dirty work, but if you have the will and manpower, employees can sort through bins after they’re full and remove the items which are causing the contamination. Recycling and composting facilities will resort the waste at their facility. These facilities have specific technologies and practices in place to sort through composting and recycling piles and minimize contamination before these items are processed. The Greater Good must win out. In this case, we need to bite the bullet on increased contamination of our recycling and composting in the short-term, to enable the education of our citizens and a much larger diversion of our waste in the long-term. With that, I call upon all business managers, owners, green teams, and others to eliminate or dramatically reduce the size of your trash can. Let’s take out the trash for good. Have you eliminated a trash can in your home or workplace? Share you story.